Get a discount when buying Volume 4 of the Story of the World! The Volume 4 Combo Pack contains one copy of the paperback text, one copy of the bound Activity Book, one extra set of Student Pages, and one copy of the Test and Answer Key. Tests for The Story of the World Volume 4. Consumable sheets from the Activity Book for The Story of the World Volume 4. Use this alongside the Story of the World text to flesh out the stories and history that your children are learning. Reading lists, activities, and map exercises give a more complete picture of life in the modern world. 421 pages. Everything you need for a full year of history and geography studies, all in one discounted package! 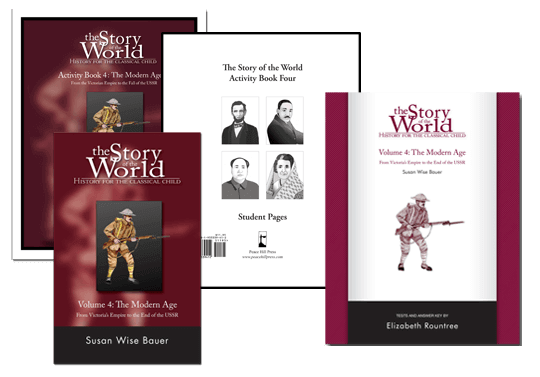 One paperback copy of Susan Wise Bauer’s best-selling history text, The Story of the World, Volume 4: The Modern Age, a narrative world history that millions of children have fallen in love with. This volume covers the years from 1850-2000. 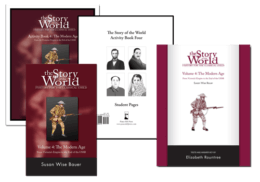 One paperback copy of the Activity Book for the Story of the World, Volume 4, complete with review questions, map activities, projects, recipes, games, literature suggestions, outlining exercises, and lists of additional resources. One set of additional consumable sheets, Student Pages Volume 4…we made extra copies of all consumable pages from the Activity Book, so you don’t have to! One paperback copy of the Test and Answer Key for Volume 4…multiple-choice, true-or-false, and short answer questions to help older students review and retain key information. Just for fun, you can add the audiobook!